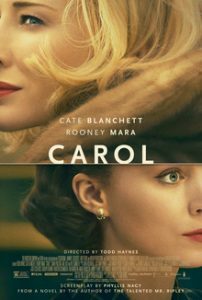 Please join us for a very special evening with Bedford’s Own superstar actress Rooney Mara for a screening of her acclaimed film “CAROL”, followed by a discussion/audience Q&A moderated by Patricia Morrisroe. Patricia Morrisroe is a feature writer and author, whose work has appeared in New York, Vanity Fair, the New York Times, Vogue, among many others. She is the author of two memoirs and a biography of the photographer Robert Mapplethorpe. Her novel about Beethoven will be published in 2020. She lives part-time in Pound Ridge.